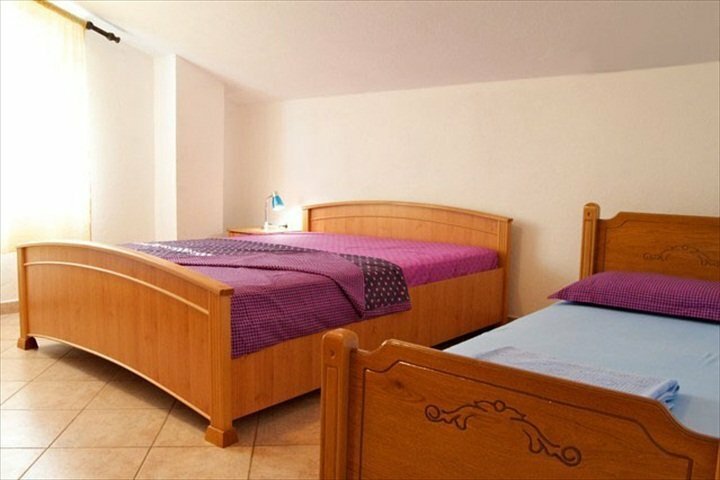 This 1 bedroom apartment is located in Tivat and sleeps 5 people. It has WiFi, parking nearby and air conditioning. Situated away from the bustling areas, but only 10-15 min away from the sandy beach, in the green area with beautiful mountain views. Just 5 minutes walk from the restaurant, 3 minutes from nice cafe bar and 10 min away from very well equipped supermarket. Quite neighborhood with tourist bus that take you to the Tivat town center. Apartment has one bedroom + kitchen with dinning room. In bedroom is placed king-size bed + 2 single beds. In another premise is placed one additional sofa bed. Apartment is equipped with kitchen, bathroom and huge terrace. Free WiFi, Cable TV and DVD player are provided, as well as parking.